The Call for Papers for the Pointwise User Group Meeting 2011 is now open. If you’re involved in CFD where either Pointwise or Gridgen are used we want to hear about your work, how you overcame challenges, and the results of your CFD simulations. This event places a premium on learning with plenty of time for interaction between presenters, attendees, our partners, and our own staff. We hope you’ll join us this November in Fort Worth. 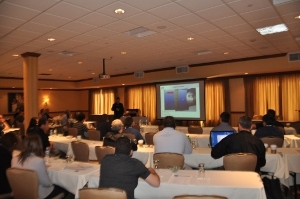 More information about the Pointwise UGM 2011 including the Call for Papers is available on our web site at www.pointwise.com/ugm. This entry was posted in Events, News, People & Places and tagged CFD, mesh generation, user group meeting. Bookmark the permalink.